Amanda Vickery’s recent inspiring TV series Women and the Story of Art has driven protests at the scant attention given to women artists to a barnstorming new high. Whereas many previous such investigations have explored the loves, disappointments and suicides of women artists, Vickery chose a different tack. The women artists she picked out demonstrated great strength of character. They bulldozed their way through the male ranks to secure the patronage of courts, establish their studios as successful businesses and keep working even when husbands, lovers and institutions attempted to steer them back into domestic quiescence. Her series culminated with Georgia O’Keeffe. Vickery closed her history with the story of how O’Keeffe, betrayed for a younger woman by her lover and agent, Alfred Stieglitz, chose not to fade away. She took herself off to New Mexico. Drawing deep on her skills as an artist, inspired by the New Mexican landscape, she reconfigured American landscape painting and opened a new era for American art. Vickery’s iconic image of the woman artist was the lone figure of O’Keeffe as caught by photographer Yousuf Karsh – proud, independent, brooding, majestically surrounded by objects that inspired her art. Kevans first established herself as an artist with her portrait series of tyrants, dictators and mass murderers as children. Bought up en masse by art entrepreneur Charles Saatchi, these portraits were a cause célèbre. The innocent faces of the young Hitler, Stalin and Mussolini are caught in Kevans’ signature light thin oils. The pictures convey a poignancy and horror. Their unsettling mood seemed to adhere even to those images for which Kevans had been unable to find a photographic original and chose instead to work back from the adult face to the child. The images raise questions about truth and falsehood in art and about hidden histories. Since then, Kevans has followed up that success with more series, of which Women and the History of the Art is the most recent. So heading to the Fine Art Society for the exhibition, I hoped in the confines of one room to sense the character, vitality and innovation of these women artists portrayed by Kevans. I looked forward to experiencing myriad personal visions of how the world could be seen. Kevans’ images aspire to uniformity. Based most often on self-portraits, they appear as bust-sized images in thin oil on paper, at 40 x 30 cm. All the women confront us with a brown-eyed steadfast gaze. They are, to a woman, presented as attractive, probably charming, and (except for a welcome tartness about Gwen John’s lips) pleasant. As viewers, we yearn to breathe life and individuality into each portrait. But the information is so scant that the uniformity of presentation serves only to drive home the fact that so many individuals have been reduced to faces in a crowd. I began to feel uncomfortable amid Kevans’ women artists. Far from distilling the women’s character, these portraits seemed to suppress their individuality. When so much of the struggle for women artists’ recognition is about rejecting the conventional view that all women’s art is characteristically light and feminine, pretty and unchallenging, how strange that an exhibition purporting to champion women artists should reduce them all to just that? The whole smacked of ‘Janeism’, that cosy and complacent love of Jane Austen’s work that has for too long buried her novels in saccharine. But perhaps something else is going on here – could it be that Kevans is trying to tell us that the woman artist is not a titanic tortured figure? She has chosen to represent her artists as human, working women, even a little suburban. However this different interpretation of what was happening in that room is undermined by the portrait of Käthe Kollwitz. Kollwitz went out of her way to dismantle the idea of angel-faced feminine beauty. Yet here she was, a hint of angst about the eyes, but essentially rendered comfortable by another pleasant portrait. There is no justification for softening the fierceness of Kollwitz’s vision. There is nothing suburban about her. Kevans’ portraits lift into view an extensive pantheon of artists: Sofonisba Anguissola, Cecilia Beaux, Marie-Guillemine Benoist, Elizabeth Butler, Gabrielle Capet, Rosalba Carriera, Mary Cassatt, Sonia Delaunay, Lavinia Fontana, Artemisia Gentileschi, Marguerite Gérard, Hannah Hoch, Gwen John, Angelica Kauffmann, Kathe Kollwitz, Adélaȉde Labille-Guiard, Giulia Lama, Lilly Martin Spencer, Victorine Meurent, Berthe Morisot, Susan Penelope Rosse, Rachel Ruysch, Dorothea Tanning, Marietta Tintoretto, Suzanne Valadon, Caterina van Hemessen and Louise Élisabeth Vigée Le Brun. A long list but it maps the American- and Euro-centric art historical canon . Other artists have attempted to reinvent the work of past artists, to raise questions about the contextualisation of the artist’s gaze. Some of these questions have explored the particularity of being a woman artist. How radical is the woman’s gaze? What happens when women, so often the subject of the gaze, turn their eyes on men? What does it mean for a woman to represent men eviscerated in battle? What are the Freudian implications of a woman artist painting Delilah cutting Samson’s hair? That work has involved a deep engagement with the artist’s work. Kevans is reaching towards that kind of exploration but she needs to show us something deeper. It is unfortunate that this saccharine exhibition opened alongside Vickery’s much feistier gauntlet thrown down to the art establishment. The exhibition is showing until 6 June 2014. Admission is free. The three images are of paintings in the exhibition. All show stylistically similar portraits of white women with brown hair. 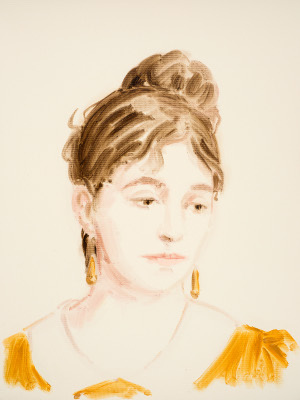 The first is Marie Bracquemond, who has her hair up and is wearing a yellow dress and earrings. The second is Berthe Morisot, who has long hair and a blue bow around her neck. The third is Elizabeth Butler, who has her hair up and is wearing a purple dress with a white ruff.